A state record blue marlin was landed recently during the South Carolina Governor's Cup Billfishing Series tournament. Angler W.C. "Corky" Taylor of Spartanburg caught the monster marlin, weighing in at 881.8 pounds, on June 3 while fishing in the Charleston Harbor Boater's World Marine Centers Billfish Tournament, the fourth of five tournaments in the South Carolina Governor's Cup series. Charleston and Georgetown. The 64-year-old angler fought the fish for an hour and 20 minutes while fishing aboard the Rascal, a 50-foot Hatteras recreational fishing vessel owned by Norman Pulliam Jr. of Spartanburg and captained by Mark Rogers of Pawleys Island. 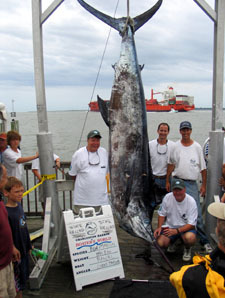 Taylor's blue marlin crushed the previous South Carolina state record of 752 pounds, 6 ounces, caught in 1993 by Dixon F. Pearce II of Mount Pleasant, also during a Governor's Cup Billfishing Series event. The new South Carolina state record blue marlin measured 135 5/16 inches from the tip of the lower jaw to the fork of its tail with a girth of 71-1/2 inches, according to Tom DuPre', S.C. Department of Natural Resources program coordinator for the Governor's Cup Billfishing Series. The world record Atlantic blue marlin is 1,402 pounds, 2 ounces and was caught off the coast of Brazil. The fifth and final Governor's Cup Billfishing Series event is the HMY/Viking MEGADOCK Billfishing Tournament in Charleston, June 30 through July 2. Visit the Web site at to learn more about the South Carolina Governor's Cup Billfishing Series, and to keep up with the standings. Questions, answers and tips about bow fishing can be found in our Fishing Discussion Forums.